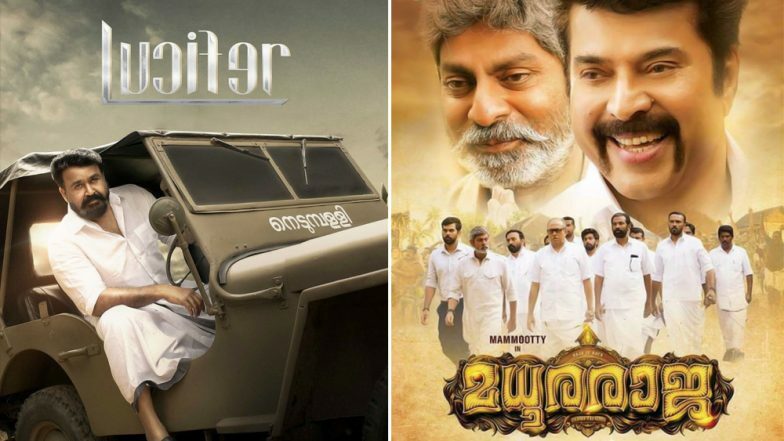 We expected Mammootty and Mohanlal to clash this Vishu at the box office, but that didn't happen. So let's clash them in this poll story. Malayalam movie lovers will agree that Mammootty and Mohanlal are the two biggest superstars that are ruling cinema from the '90s to the present. While their die-hard fans often clash with each other over who is the bigger star, Mammootty and Mohanlal never show that animosity, at least in public, and are good friends. Padma Awards 2019: Mohanlal’s Picture With PM Narendra Modi Wins Hearts, Fans Post Congratulatory Messages for Lalettan. In the present era, Mohanlal may have an edge over Mammootty when it comes to delivering bigger hits and having better critical consensus. His last film, Lucifer, came out a couple of weeks back and broke several records at the box office. Thanks to the hype surrounding the film, the movie took off to a flying start and earned Rs 100 crore within eight days at the worldwide box office. Lucifer was much anticipated among Lalettan fans for making the superstar return to his grey roots and for being actor Prithviraj Sukumaran's first directorial venture. Box Office: Lucifer Enters Rs 100 Crore Club in Just 8 Days; Mohanlal Congratulates Prithviraj Sukumaran and Team in His Tweet. There is also that terrific cast involving the likes of Manju Warrier, Indrajith Sukumaran, Vivek Oberoi, Tovino Thomas, Saikumar and Prithviraj himself. Even though the movie got only a mixed response from critics, fans have lapped it up easily. Lucifer Movie Review: Prithviraj Sukumaran’s Directorial Debut Is A Cliched But Stylishly Shot Fanboy Tribute to Mohanlal’s Mass Persona. A couple of days before Vishu arrives Mammootty's Madhura Raja, a sequel to the 2010 blockbuster Pokkiriraja. Both the films are directed by Vysakh, who gave Malayalam cinema its first Rs 100 crore grosser in Pulimurugan. Expectations are sky-high from Madhura Raja to be a record breaker, considering how Mammootty's character Raja in the first film was so well-received. Prithviraj, who was the other male lead in Pokkiriraja, is not returning for the sequel because of his involvement in Lucifer, something Madhura Raja also reminds you. In his place, arrives Tamil star Jai, who is known for his roles in Chennai 600028, Goa, Engaeyum Eppothum and Raja Rani. The other actors in the cast are Jagapathy Babu, Anusree, Mahima Nambiar, Siddique, Aju Varghese, Salimkumar, Kalabhavan Shajohn and so on. Madhura Raja Movie Review: Mammootty in Good Form, but Struggles to Raise This Vysakh Film From Mediocrity. Mammootty's Madhura Raja or Mohanlal's Lucifer - Which Film Impressed You the Most? So which of these blockbusters have impressed you the most? Vote in the box above and share your thoughts in the comments section below.